Megalithic Passage Tomb, Bruna Boinne Complex, County Meath, Ireland. The Neolithic Passage Tomb at Newgrange (Dun Fhearghusa), part of the extensive Bru na Boinne complex in County Meath, is one of the most famous Megalithic monuments in the world and the most famous site of Neolithic art in Ireland. Carbon-14 dating methods indicate that Newgrange was constructed between c.3300-2900 BCE, that is 500 years before the Great Pyramid of Giza in Egypt, during the late Stone Age or early Bronze era. Megalithic art experts calculate it took a workforce of 300, about 20 years to complete. Like other similar architectural examples of prehistoric tombs, Newgrange was precisely constructed to be aligned with solar activity: each year at dawn from the 19th to the 23rd of December, the rising sun illuminates the interior of the burial chamber for 17 minutes. The cultural importance of Newgrange lies in its sophisticated design and the insight it provides into the values and capabilities of prehistoric Ireland. Although built partly as a necropolis, Newgrange - like other Passage Tombs - was an important ceremonial centre of the time. In addition, its intricate prehistoric engravings and other petroglyphs (like similar incised spiral motifs at the Knowth megalithic tomb) mark the first significant step in the history of Irish sculpture. NOTE: For a guide to abstract symbols used in the Paleolithic and Neolithic, see: Prehistoric Abstract Signs (40,000-10,000 BCE). one of the great megaliths of Meath. and in the early Christian era. The kidney-shaped Newgrange mound stretches 250 feet across and 40 feet high, and occupies an area of about one acre. Inside the mound, a 60 foot long passage leads to a cruciform (cross-shaped) burial chamber which has a steep corbelled roof about 20 feet in height. Just before and after the winter solstice, a shaft of sunlight peeps through a specially made opening (roof-box) in the roof above the entrance and beams down the passage to illuminate the chamber. This dramatic solar event was first witnessed by archeologists in 1967. Although other Irish Passage Tombs are aligned in this manner, Newgrange is the only one which the sun enters through a roofbox. Megalithic art forms at Newgrange include spiral and rhombus-shaped motifs engraved on the entrance slab, notably the triple spiral motif, which is unique to Newgrange. This artistic pattern (suggestive of the triskelion motif seen on the Isle of Man and at Anglesey, in Wales), engraved by unknown Irish artists, is repeated along the passage walls and again inside the burial chamber. Also, in the passageway are a number of stone carvings featuring concentric circles, herring bones, zig-zags, axes, bows and arrows, which became regular features in later Celtic culture. Notwithstanding Newgrange's own unique contribution to our understanding of Irish Stone Age art, the richest source of megalithic art in the Brú na Bóinne complex is to be found at the Knowth Passage Tomb. Archeological evidence shows that construction at the site of the Newgrange mound and burial tomb continued over a period of time. New monuments were added to the site, such as a timber circles to the west and south east of the mound. In addition, about 1,000 years later, during the Irish Bronze Age, the entire burial mound was encircled by an outer ring of huge stones, only twelve of which remain. This henge (circle of standing stones) was established in the same period as those at Newgrange Site A, Newgrange Site O, Dowth Henge and Monknewtown Henge, as well as the Stonehenge trilithons in Wilshire, England - although the initial Stonehenge monument was built at the same time as Newgrange (c.3200 BCE). Interestingly, the Gavrinis Passage Tomb in Brittany - a very similar structure to Newgrange - was constructed 2,000 years before Newgrange (c.5500 BCE). 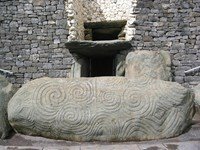 To see how the architectural art of Newgrange fits into world design, see: History of Architecture. After lying undiscovered for nearly 5,000 years, the Newgrange neolithic monument was intially discovered in 1698 by workmen searching for stone. Not until 1962 was it properly excavated and restored - a process lasting 13 years and supervised by the archeologist Professor Michael J O'Kelly, from Cork. There is no general admission to the burial tomb at Newgrange during the Winter Solstice. Instead 50 visitors (10 for each morning the tomb is illuminated) are chosen by lottery. In 2006, almost 27,500 applications were submitted for the draw in September. Aside from the Winter Solstice, the Newgrange megalithic site receives over 200,000 visitors a year. It has been designated a World Heritage Site by UNESCO and is considered to be the national monument of Ireland. Its intricate carvings and designwork represents the first step in the history of Irish art.  For information about the cultural history of Neolithic Ireland, see: Irish Art Guide.  For more on the history of other megalithic monuments like Newgrange, see: Homepage.